Whispers in the Loggia: "Two Gestures" – In Lord's Supper, "Let Brotherhood Be Contagious In the World"
"Two Gestures" – In Lord's Supper, "Let Brotherhood Be Contagious In the World"
Yet again continuing the practice he began in Buenos Aires, the Pope took his Evening Mass of the Lord's Supper on the road to his cherished "peripheries," with this year's venue packing the added thread of immense relevance across much of the Western world. As the Syrian refugee crisis – the world's largest forced movement of persons since World War II – continues to resonate far and wide, and with Tuesday's attacks in Brussels spurring a fresh burst of scrutiny of migrants in Europe and beyond, in yet another reinforcement of his solidarity with the displaced, Francis chose to bring this year's opening of the Triduum to a refugee center at Castelnuovo di Porto, 15 miles outside Rome, where the community of 900 transients (from 25 countries) is mostly non-Catholic. Due to the size of the throng, the Mass (fullvideo) was notably held outdoors, with the altar sheltered under a tent. 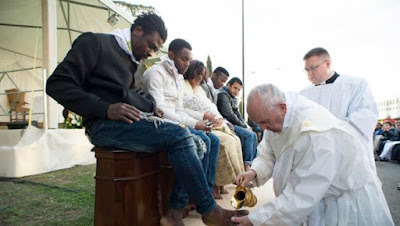 While the wider church is now officially permitted to include women and children in the liturgy's rite of the Washing of the Feet thanks to the January decree issued at Francis' behest, like many pastors Papa Bergoglio had long taken to doing it anyway. Among the 12 chosen for tonight's edition of the rite were four women; per Italian reports, the whole group included three Muslims, a Hindu, and a worker at the facility alongside the refugees. According to an explanatory note released on Tuesday from the Pontifical Council for Promoting the New Evangelization (the Vatican arm overseeing the coordination of this Jubilee Year of Mercy), the Pope wanted his intent to be unmistakably clear: by "washing the feet of the refugees, [he] demands respect for each one of them," and to underscore anew in the process "the path of respect as the high way towards peace." As has invariably been the case over this liturgy's earlier editions at youth prisons and a nursing home, as the moment unfolded among the migrants, tears could be seen in the eyes of those who took part and the rest looking on. Even today, here, there are two gestures: this, of all of us together, Muslims, Hindus, Catholics, Copts, Evangelical [Protestants] brothers and sisters – children of the same God – we want to live in peace, integrated. One gesture. Three days ago, an act of war, of destruction in a European city, by people who do not want to live in peace. Though behind that gesture, as there were behid that of Judas, there were others. Behind Judas there were those who offered money, that Jesus be delivered up to them. Behind that [other] gesture [on Tuesday in Belgium], there are manufacturers, arms dealers who want blood, not peace; they want the war, not fraternity.